The International CCS Knowledge Centre is pleased to host the 13th annual IEAGHG Summer School in conjunction with the IEAGHG. 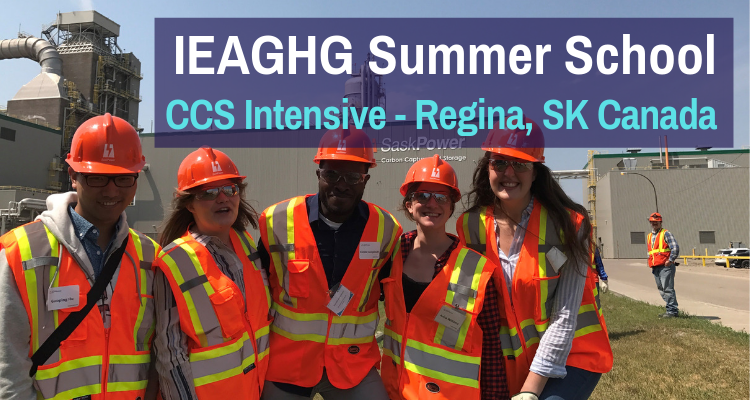 This week of intensive learning about carbon capture and storage (CCS) will take place in Regina, SK CANADA from July 7 - 12, 2019. IEAGHG’s Summer Schools are the only CCS education program to have a truly international focus. This program moves around the world and has taken place in seven countries covering Europe, Australia, Asia and North America. The annual event attracts experts from all over the world and as a result the summer school includes a diverse range of students from a variety of technical backgrounds. The summer school has over 550 alumni representing over 50 countries with many moving on to successful careers within CCS industry and academia. To apply for the summer school please CLICK HERE. Please download the Guide to Applications HERE for more information. The target group for the summer school is young scientists and researchers, e.g. PhD students with a background in engineering, geo-technologies, and socio-economics. This can also include those in the early stages of their career within 5 years of graduation currently seeking a greater understanding of CCS. Deadline for application is: Friday 15th of February 2019 (midnight GMT). For further details on how to apply, CLICK HERE. The intensive 5-day event will commence the evening of Sunday July 7th and conclude with a final dinner on Friday July 12th. The week will also include a visit to the Boundary Dam 3 CCS Facility and Aquistore storage site. A detailed itineray for the IEAGHG Summer School is being finalized. Further details will be posted soon.